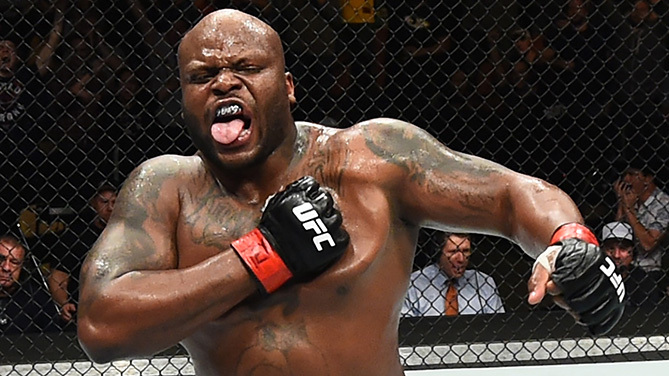 Derrick Lewis celebrates after defeating Marcin Tybura by KO during the UFC Fight Night event on February 18, 2018 in Austin, TX. 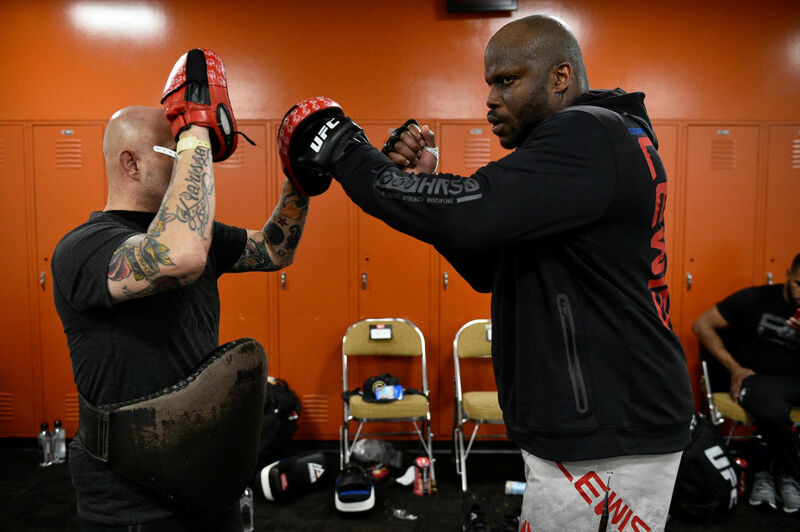 (Photo by Josh Hedges/Zuffa LLC)" align="center" /> Derrick Lewis didn’t look like himself during the opening two rounds of his fight with Marcin Tybura in Austin, Texas earlier this year. Rather than coming out swinging like he usually does, Lewis was hesitant and sluggish, giving his Polish adversary a chance to dictate the terms of the fight and race out to an early lead on the scorecards by bringing the fight to the ground and nullifying Lewis’ knockout power. While he always found his way back to his feet, the 33-year-old Texan just couldn’t seem to get his offense going, and even through the first half of the final round, Lewis was having trouble pulling the trigger and Tybura looked well on his way to collecting a victory. But in the span of 20 seconds, Lewis changed all that. He stuffed a takedown and spun Tybura to the canvas momentarily and blasted him with a massive right hand as he looked to separate and create space once he got back to his feet. A thudding left hand followed and just like that, “The Black Beast” was back in the win column. As it turns out, the Houston native was just hungry. “Backstage when we were warming up, I didn’t have any energy; my energy levels were real low,” recalled Lewis, who returns to action Saturday at UFC 226 in a colossal heavyweight showdown with Francis Ngannou. “The commissioners, the guys that watch the fighters, they came and asked if I was okay, this and that, but I just didn’t have the energy. During the fight, my energy still wasn’t there. Despite the lack of energy and fighting on an empty stomach, Lewis left Austin with a victory, giving him seven wins in his last eight appearances and keeping him firmly entrenched in the heavyweight Top 10. This wasn’t the first time the soft-spoken, heavy-handed big man has been forced to rally back to collect a victory. In fact, it has been a bit of a signature move for Lewis, who pulled off the feat against Viktor Pesta, Shamil Abdurakhimov and Travis Browne during the six-fight winning streak that turned him from being a cult figure competing on the prelims to a burgeoning star headlining fight cards. And while it’s certainly not the way he would like his fights to play out, Lewis admits that having that experience and knowing that he can push through is a positive should the situation arise again in the future. But there is no reason to worry that Lewis won’t feel up for a good slugfest this weekend as he has been angling to share the cage with Ngannou since the hulking physical specimen first started climbing the heavyweight ranks, and he will finally get to throw down with the Cameroon’s “Predator” in the middle of Saturday’s Pay-Per-View main card. While the sardonic knockout artist has poked fun at Ngannou in the past on social media, his reason for wanting to face his fellow finisher is quite simple. Saturday’s contest will be Ngannou’s first since failing in his bid to claim the heavyweight title earlier this year in a bout with UFC 226 headliner Stipe Moicic. In that contest, the heavyweight champion used his wrestling to ground Ngannou and forced the challenger to carry his weight. Though there were moments where the two powerhouses traded blows on the feet and a handful of punches came dangerously close to finding a home for both parties, in the end, deploying a tactical game plan and playing to his strengths secured Miocic the victory. So will Lewis take a similar approach on Saturday? Since he’s sharing the card with the duo this weekend, Lewis admitted he might ask them for some wrestling tips and insights into how to beat them, since he could end up facing the winner of this weekend’s heavyweight championship SuperFight in the future. As for Ngannou, he’s not sure what to expect from his opponent this weekend, but if things go the way he envisions them, Lewis is hopeful that the fans will go home happy and he’ll be heading home with a victory in hand. “I just see him coming in for a double-leg takedown straight off the bat,” laughed Lewis. “I don’t know. Hopefully it will be an entertaining fight – a back-and-forth fight all the way out, all three rounds.